Halloween is just a few days away, and now that I'm too old to run around the neighborhood trick-or-treating, I like to spend my Halloween night watching Hocus Pocus, snacking on junk food, and anxiously awaiting the youngsters to come-a-ringing. 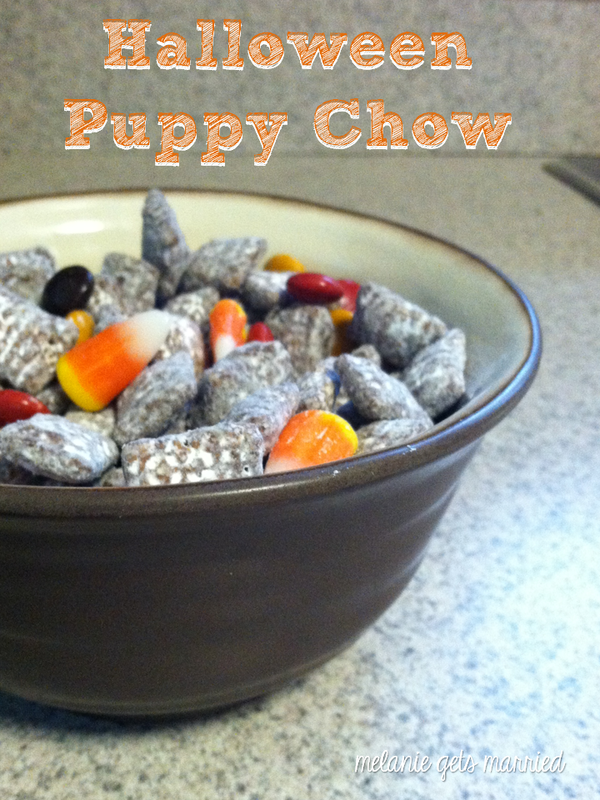 This year, I decided to make a Halloween-themed puppy chow to munch on while hanging out with the Sanderson Sisters. Here is the recipe in case you decide to whip some up in the next few days, or any time this fall! 1. Melt chocolate chips in a saucepan over low heat, stirring constantly. 4. Remove chocolate and peanut butter from heat and pour over cereal. 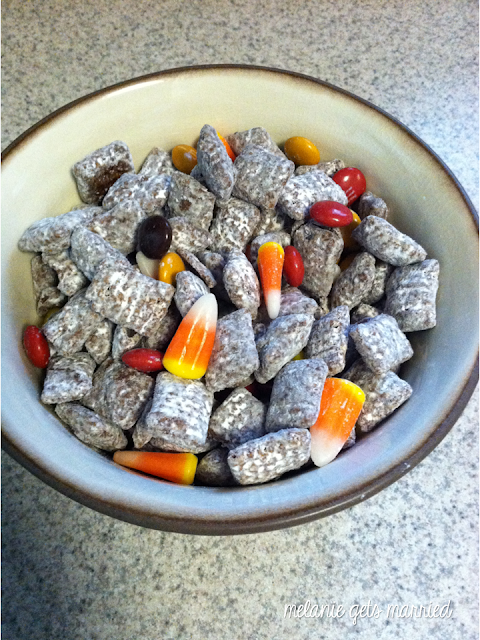 Mix until the cereal is completely coated with chocolate. 5. 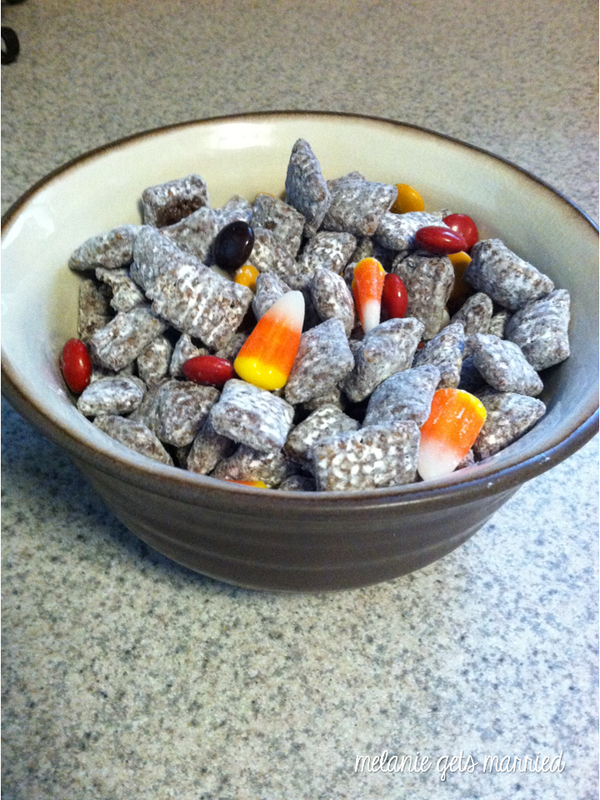 Put the chocolate covered cereal into a large ziplock bag and pour in the powdered sugar. 6. Shake the bag until all the cereal is coated in powedered sugar. What are your big plans for Halloween? Anyone else planning to curl up on the couch watching Hocus Pocus? so fun! We're trick or treating out, so no need to entertain this year. :) I still wouldn't mind whipping up a bit of this chow. Thank you for linking up to Super Sunday Sync!